In them, a Native American man steadily beats his drum at the tail end of Friday's Indigenous Peoples March while singing a song of unity for indigenous people to "be strong" in the face of the ravages of colonialism that now include police brutality, poor access to health care and the ill effects of climate change on reservations. Other youths, some wearing clothing with Covington logos, surround them, laughing and shouting. The Cincinnati Enquirer reported that Laura Keener, the communications director with the Roman Catholic Diocese of Covington, on Saturday said: "We are just now learning about this incident and regret it took place". A school in the USA apologised Saturday (Sunday NZ time) after videos emerged showing students from a high school mocking Native Americans outside the Lincoln Memorial after a rally in Washington. "This is Indigenous lands". We're not supposed to have walls here, we never did, for millennium before anybody else came here. Phillips, an Omaha tribe elder who fought in the Vietnam War and now lives in MI, has always been active in the indigenous rights movement. 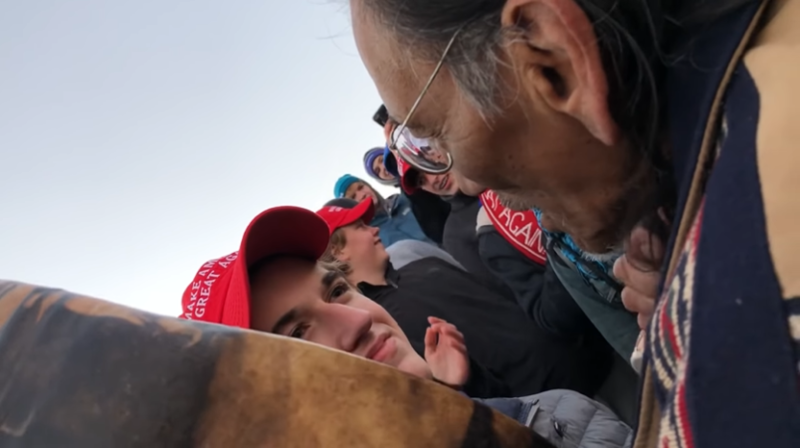 Footage of a group of teenagers - many wearing Make America Great Again caps - taunting a Native American man in Washington DC has drawn criticism. "I felt like the spirit was talking through me", Phillips said. In the video below Phillips responds to the harassment. Church officials say they are investigating and will take appropriate action, up to and including expulsion. WCPO has reached out to Covington Catholic for comment and have not heard back yet. Other boys circled around, she said. "To have our elders who are closing out, you know, a attractive day - one that started kind of chilly and cold, but the sun came out and joined us and blessed us - to have them go through that was a particularly egregious ordeal", he said. A few of the young people chanted "Build that wall, build that wall", the man said, adding that a teen, shown smirking at him in the video, was blocking him from moving. Local activists have decried the actions of the students. U.S. Rep. Deb Haaland, D-New Mexico, who is a member of the Pueblo of Laguna and had been at the rally earlier in the day, used Twitter to sharply criticize what she called a "heartbreaking" display of "blatant hate, disrespect, and intolerance". "I wish I could see that energy of that young mass of young men, put that energy into making this country, really, really great, helping those that are hungry". "We always took care of our elders, took care of our children".